I hope you all will be having a spooky time this Halloween. 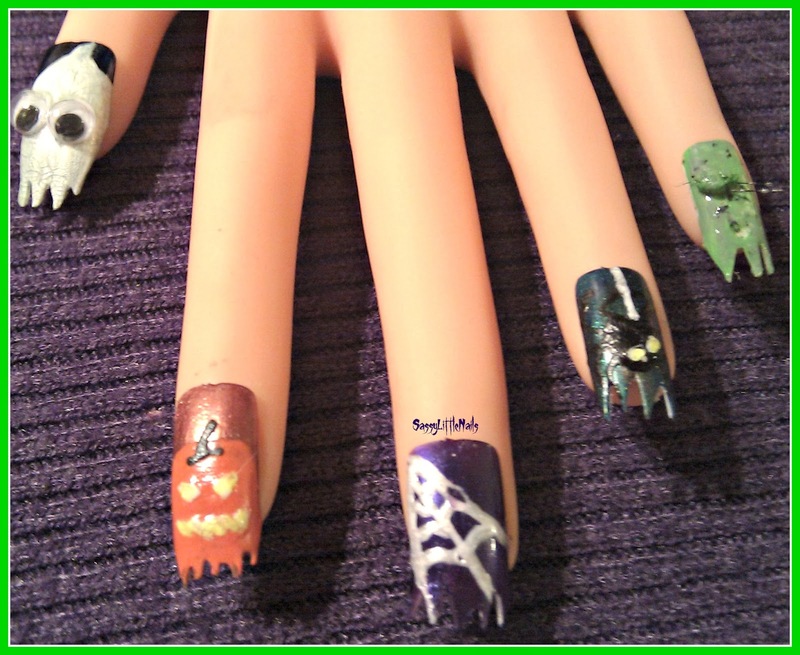 I have done a Halloween nail art with glow in the dark nail polish! 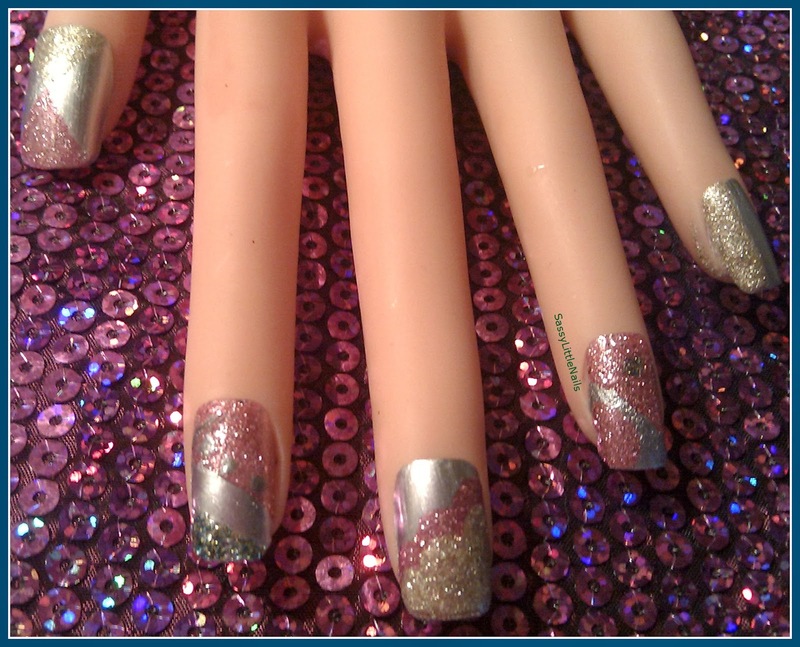 Here is the items used to create this mani.from top left to top right. 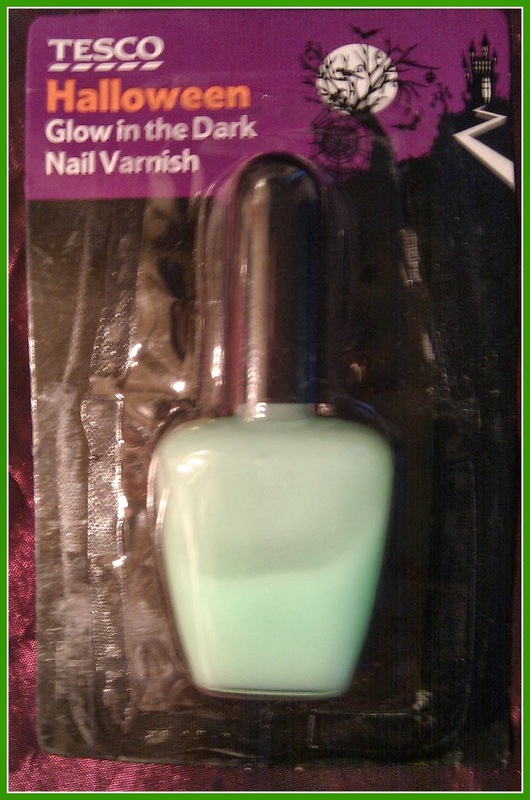 Tesco glow in the dark Halloween nail polish. NYC expert polish in Midnight Amethyst. Rimmel London pro polish in Midnight Blue. Technic nail art pen in white. 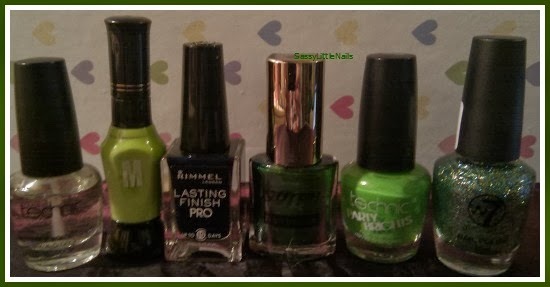 From bottom left to right..
La Femme beauty polish in Neon Yellow. MUA polish in Koala bear. Laval Crystal finish polish in Chocolate. Disney nail art pens in pearly white and black. I started with cutting False nails in zig zag type of jaggered edges.Then on the Thumbs I started with Rimmel polish as a base.Then when dry I painted a white wavy head with Disney nail pen in pearly white.once dry I then added 2 drops of nail glue for the Googly eyes and stuck them on. Next I used the Laval crystal polish in Chocolate for the finger base.when dry I then painted a round circle with the Essie polish.I gave it a few coats then when dry I used the white nail pen for the eyes and mouth then when dry went over them with the Neon yellow using a nail art brush.then the black for the top. 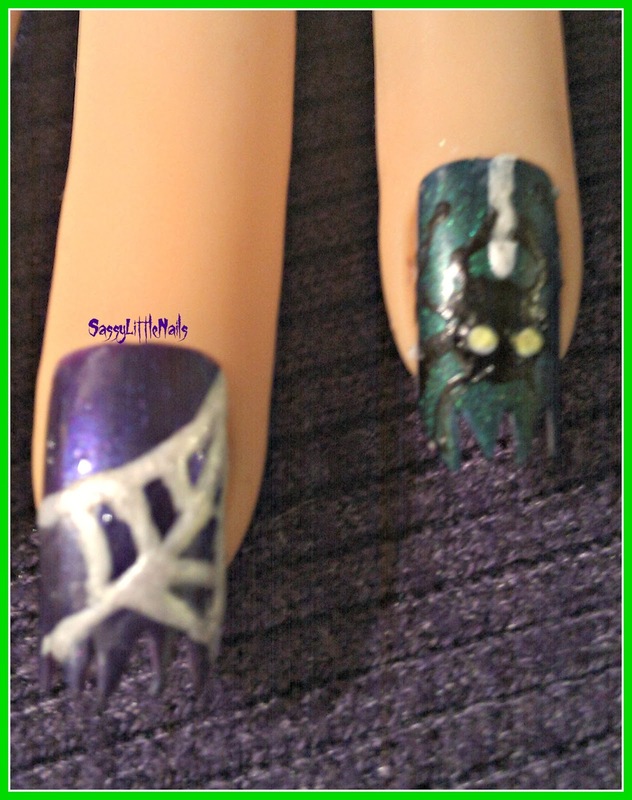 For the middle finger I used the NYC polish as a base.once dry I then used the Disney nail art pen to make a web. Then wedding ring finger I used the Rimmel polish as a base then when dry went over the nail with the Maybelline polish to give it a greenish sheen. 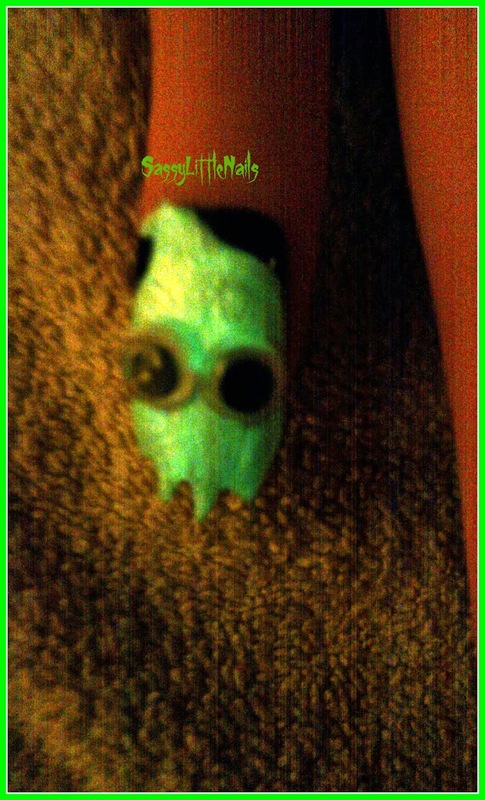 I used the Black nail art pen to paint a spider.then dotted to white eyes and again went over them with the Neon yellow. For the little finger I used the Technic party brights polish in AYA NAPA.then used 1 coat of MUA polish then when dry I rolled up some tissue and dabbed it in the same polish and then some nail art glue took some loose hairs off an old paint brush and cut them to size stuck a few on the glued tissue then used a blob of glue and carefully placed the wart on the nail.I then used some more tissue all crumpled up and dabbed some black polish on it and dabbed it over the nail.Then went over the nails with clear top coat. 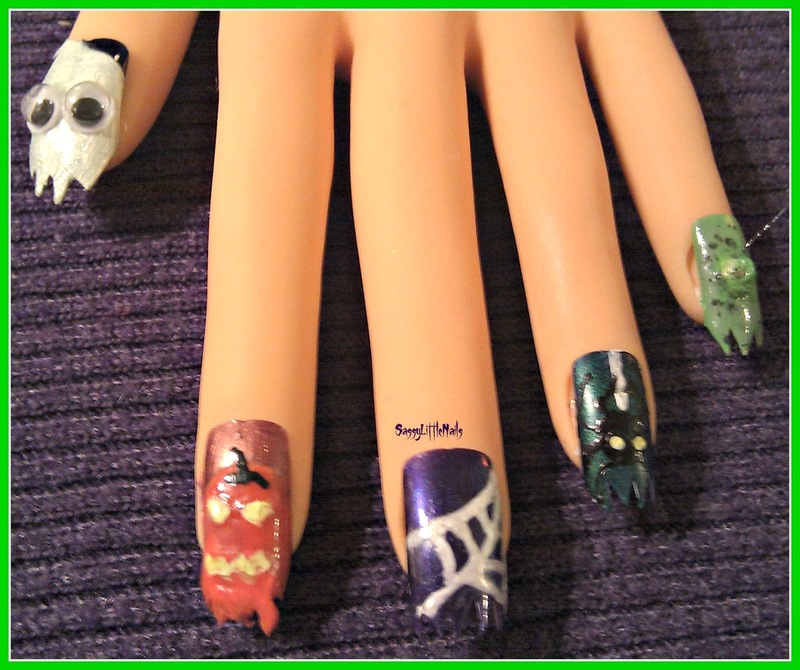 I hope you liked my Halloween nail art.Have fun! Hiya Friends Hope you all keeping well. 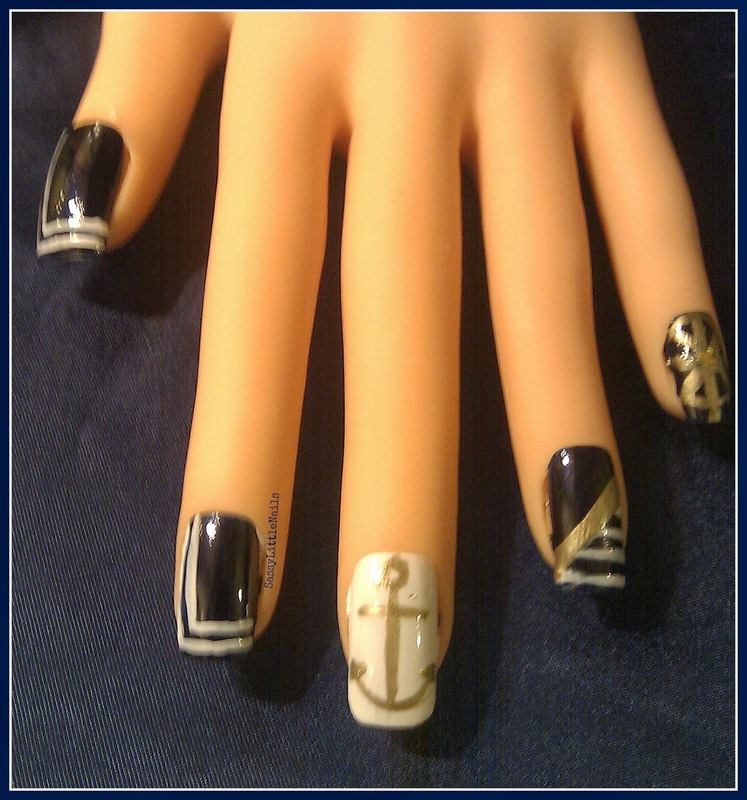 I want to share this Royal navy nail art with you today in Memory of my late Father-in law Denis. Dad (Denis) sadly passed away on the 28th October 1996, 17 year's ago today from lung cancer he was 53 year's old. Dad was loved by all,such a lovely man and a gentle soul. Dad always made me smile and laugh he was a kind hearted man and I am glad I got to know him and bonded with him in the short 2 year's I knew him. 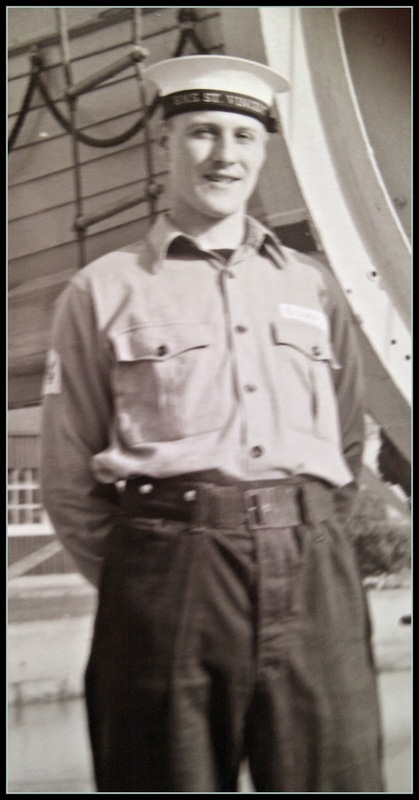 He joined the Royal Navy when he was a young man and trained to be a Royal engineer and he loved it! So I decided to do a nail art in the Navy theme in memory of Dad. Technic Gold and White Nail art pens. Wet n Wild White manicure polish. Rimmel lasting pro finish in Midnight Blue. I painted a base coat on all the nails with the Rimmel polish. I used the White nail art pen and made2 L shaped lines. 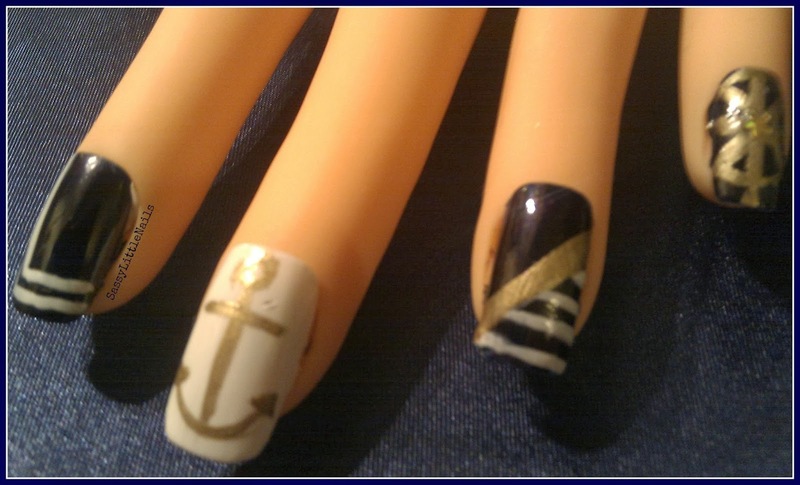 Then I painted the middle finger with the white polish and used the Gold nail art pen and drawn a anchor. I then did some white stripes across and 1 gold stripe. The little finger I used the gold nail art pen and drawn a ship wheel.and stuck a gold bead in the centre. 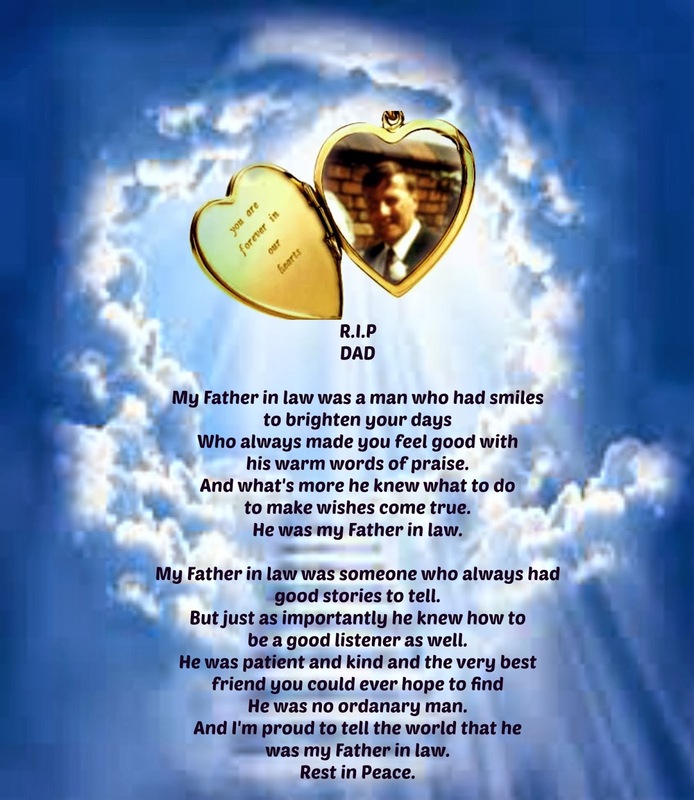 We love and miss you Dad always in our hearts and memories. More posts coming up shortly..Brrrrr it's a bit chilly out there! Go and give someone you love a massive warm hug! 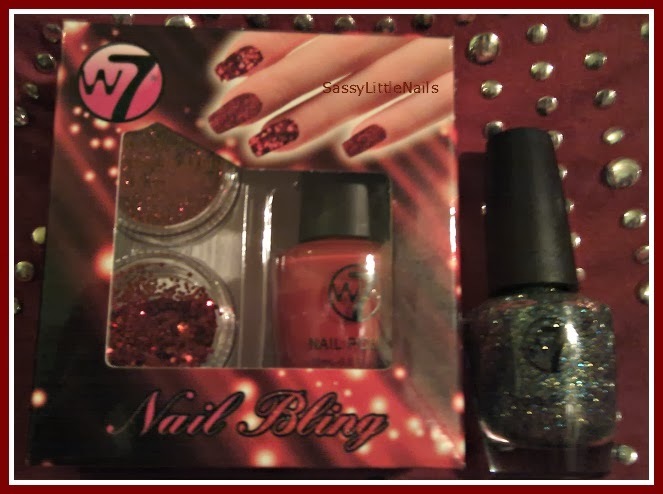 Hello peeps I was sent a W7 Nail Bling Nail Art Glitter Set-Red Rascal, along with a W7 Glitter polish in Cosmic Green from the lovely Aqua PR! 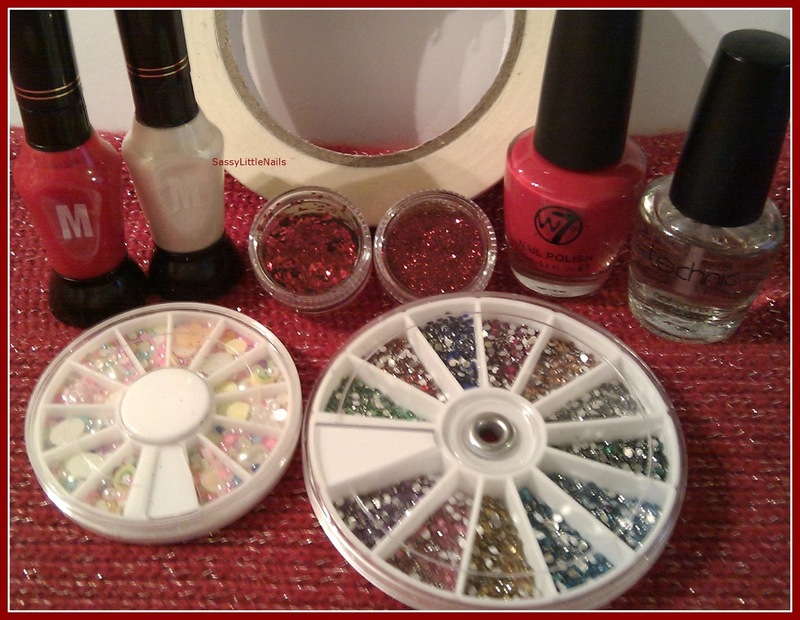 List of items used for this mani from left to right..
Disney nail art pens in Red and cream/white. 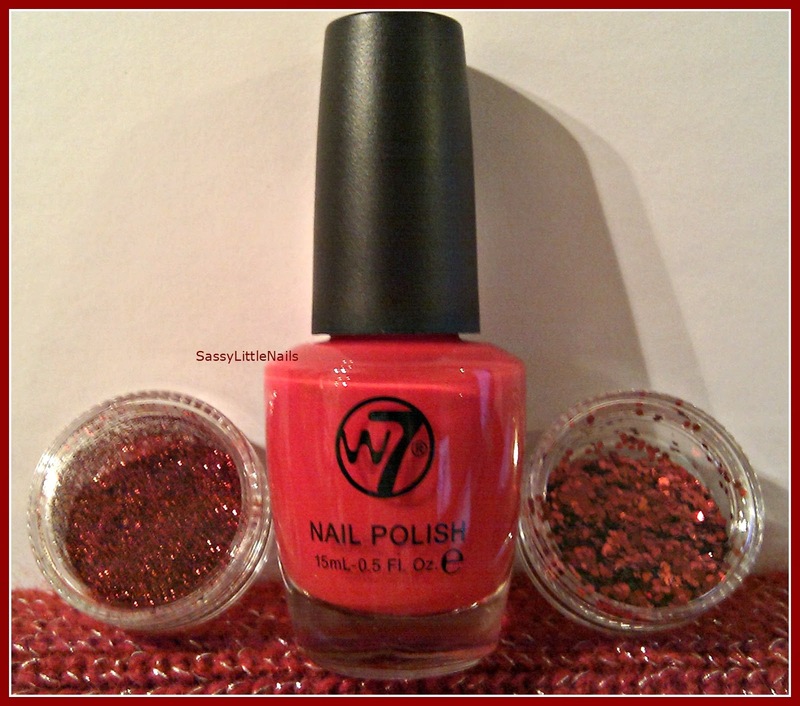 W7 Glitters Red Rascal small and large. The thumb I taped off and took some clear polish and sprinkled the glitter on the wet top coat. I repeated this taping off with the nail tips.Middle finger I used the Nail art pen and drawn a butterfly shape.went over it with the clear polish and sprinkled the red glitter and placed 1 pearl bead on the swirl.The little finger I used the red rhinestones down the nail.applied a top coat and all done! 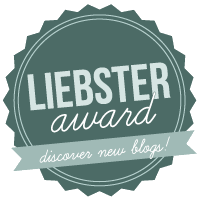 Check back shortly for more posts! Hi Everyone hope you all well.I thought I would share this nail challenge with you. 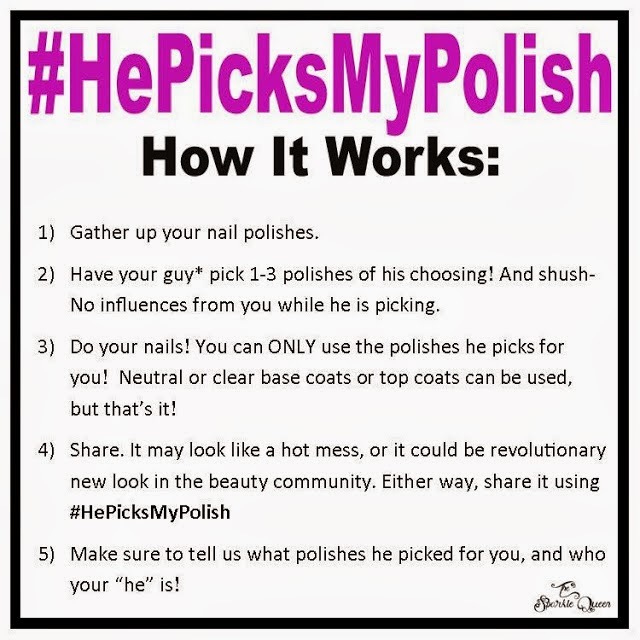 The Sparkle Queen: #HePicksMyPolish October Challenge: We are at it again! 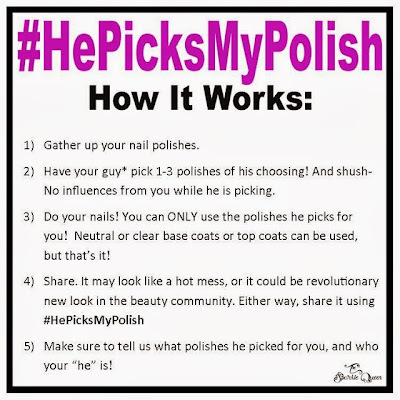 We had such a fun time with the September #HePicksMyPolish challenge that we thought we would do another round in October. 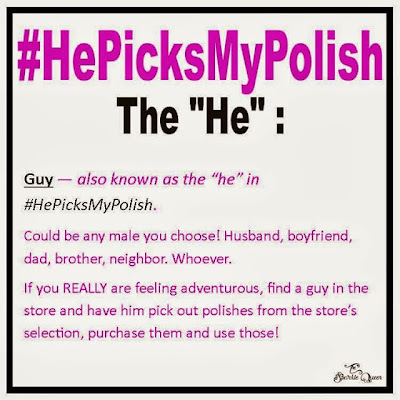 I thought I would ask my Husband Ste to pick 3 polishes for me without any influence from me at all! 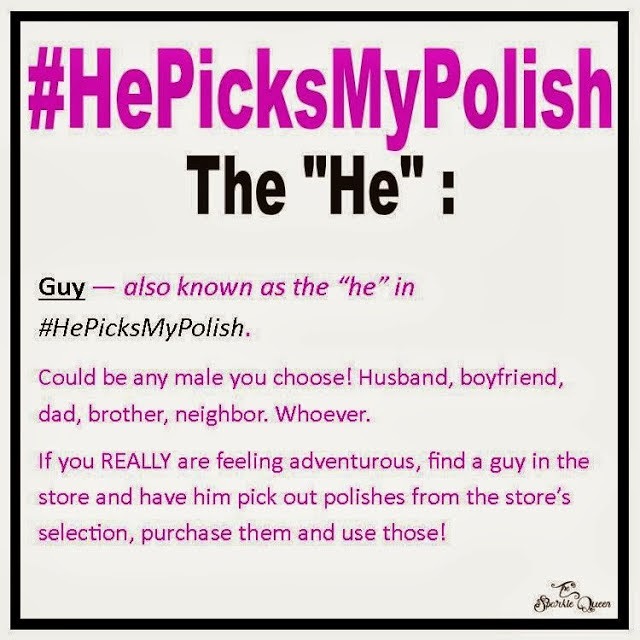 He was drawn to 3 Glittery polishes lucky me!! lol and 1 Metallic Polish! 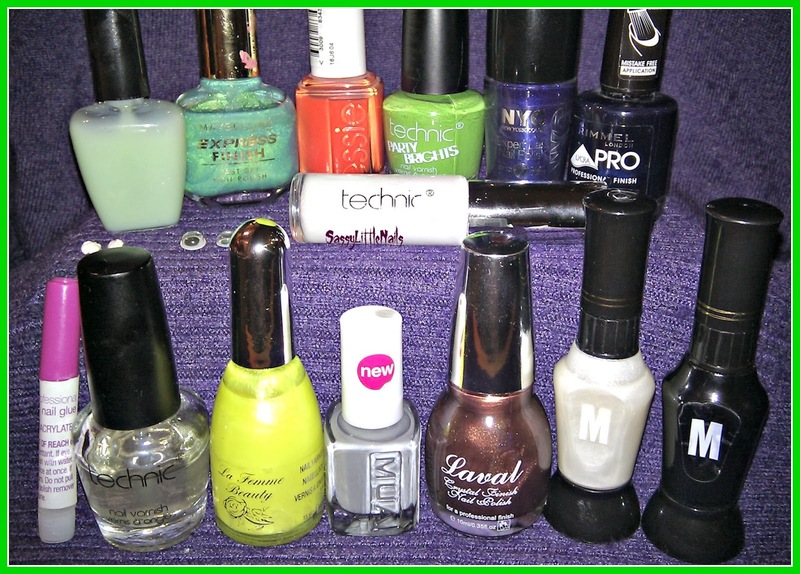 Here is Ste's choice of Nail Polishes he chosen for me. (with an added,was a clear glitter Polish W7). From left to right..2True pro sequins glitter Polish in Elle. 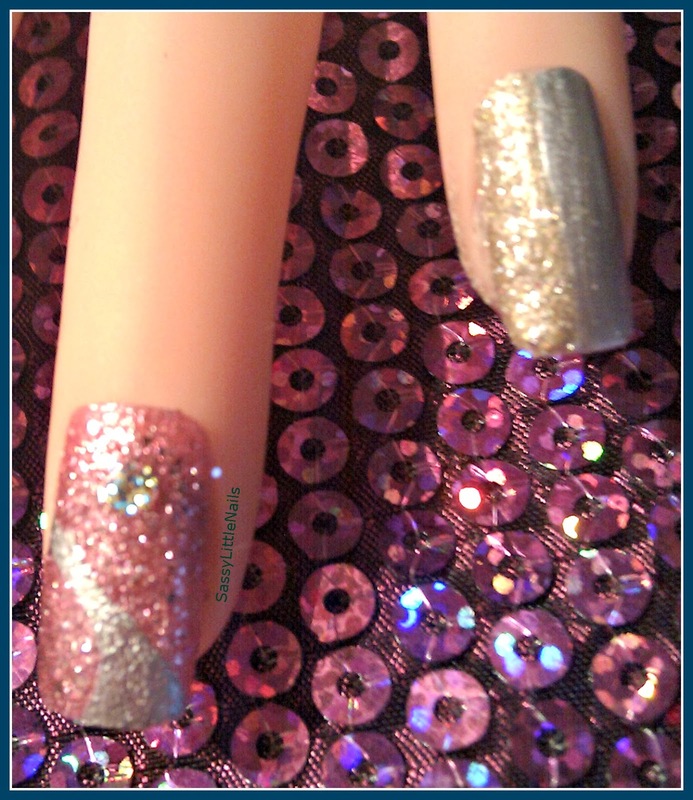 2True pro glitter sequins Polish in Tyra. W7 Nail glitter in Cosmic Green. Barry M Nail Polish Foil effects. 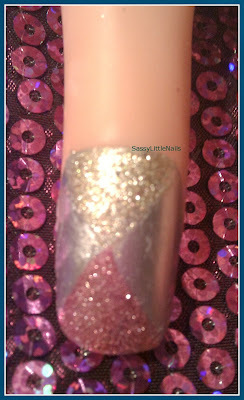 I started with the Thumbs and thought I would do tri-accent nail design using the Barry M silver as a base then tape to make the triangles for the 2true glitters in Tyra and Elle. I then used the Barry M silver as a base for the 2 fingers.1st finger I used tape again across the finger using the 2True Elle glitter.Then I did 3 dots using the Barry M.Then then nail tip I used the W7 glitter in Cosmic Green. The middle finger I used 2True glitter Elle polish 3 strokes going slightly lower than the last.Repeated this process again using the 2True glitter in Tyra. I then painted the wedding finger nail with the 2True glitter in Elle.Then I did a wavy line in Barry M silver.Then did a drop of the W7 glitter. 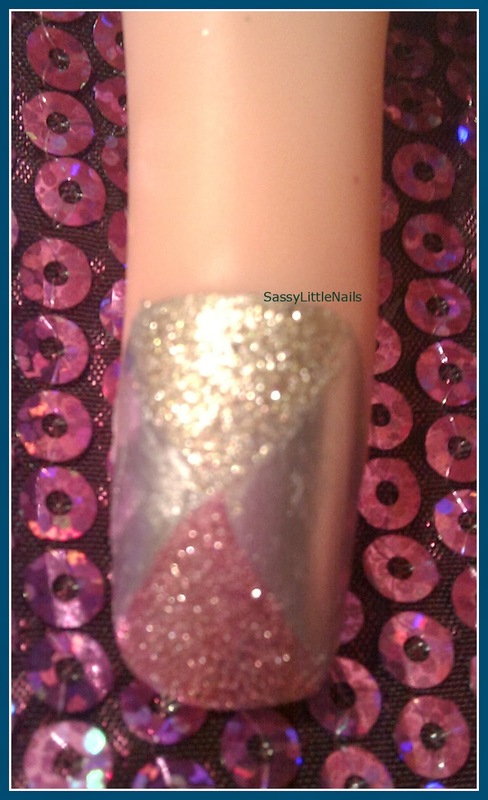 The Little finger was a simple half n half,2True glitter in Tyra and then Barry M silver. More posts coming up shortly! Hey all hope your Sunday is going well and good. 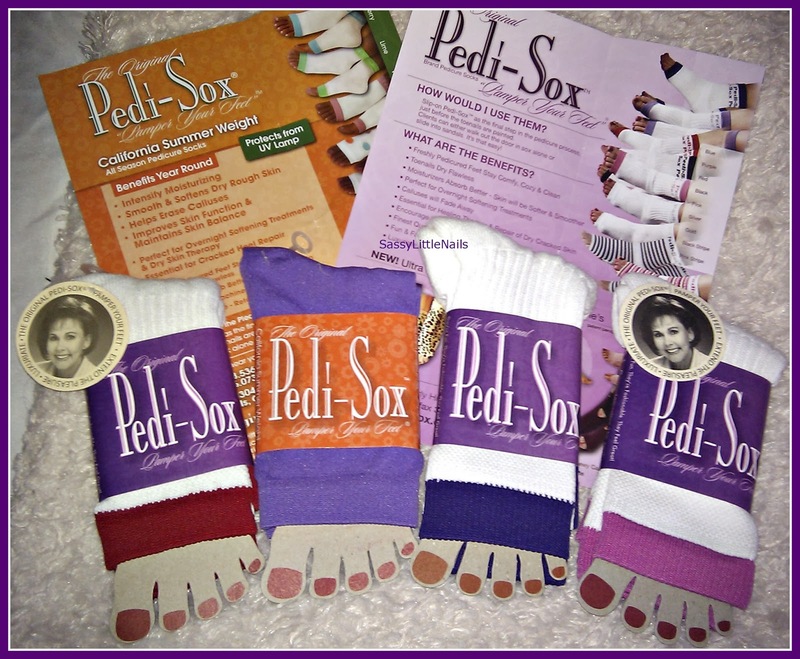 I was sent by the lovely Pamela Berryhill Founder The Original Pedi-Sox® Brand Pedicure Socks to Review. I absolutely adore these socks! Pedi-Sox® are unique one-of-a-kind toeless pedicure sock. Designed to provide solutions to pedicure dilemmas, Pedi-Sox® luxuriate & prolong the pleasure of the pedicure experience - year-round. those tile floors can be so cold in the winter. 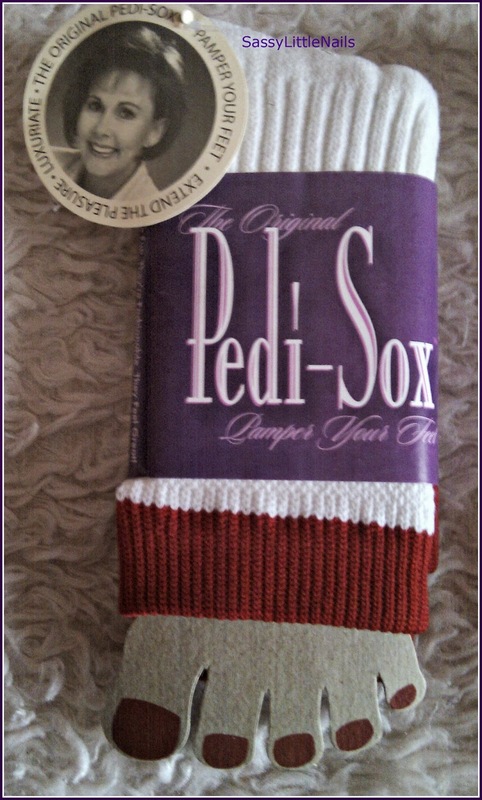 • Sox Aid Moisturizer Absorption ...for softer smoother feet. • Toenails Dry Flawless ...just what every girl wants. 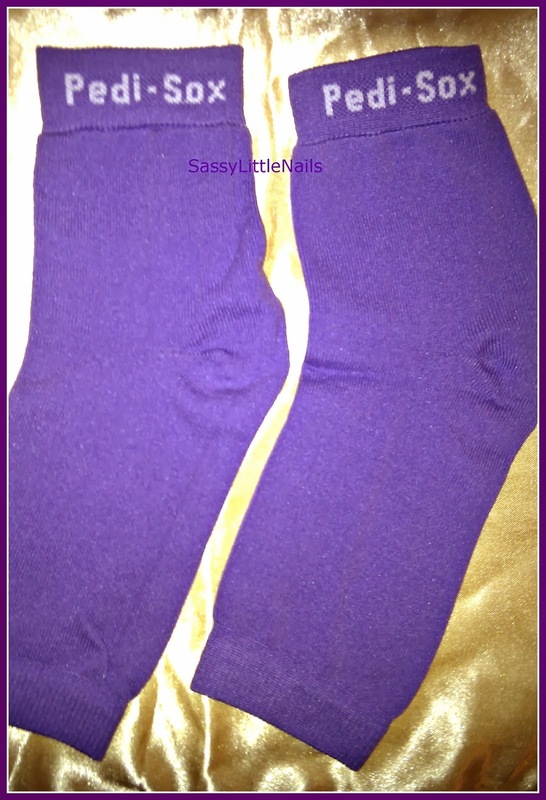 • Repair Heels...Pedi-Sox® are essential to repair dry cracked skin. 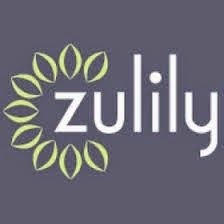 • Lock-In Benefits....of healing serums, creams and treatments. • Callus Elimination...Pedi-Sox® help soften & fade calluses. even in the coldest winter months. • Simply..... skin will look and feel healthier. Just slip on Pedi-Sox® at the end of the end of the pedicure process, right before the toennails are painted. You can either walk out the door in sox alone or slip into sandals. It's that easy! What Pamela says about the Socks..
Pedi-Sox®. A quality sock designed and manufactured strictly for pedicures which can be used over and over! Pedi-Sox® come in an assortment of styles and fashionable colors while being priced affordably. Now those who enjoy pedicures can keep their feet comfy and clean, allow moisturizers to absorb better and protect their nail polish - while extending the pleasure of the pedicure experience. My thoughts about the Socks. I could not wait to try these Socks!being diabetic it is very important to look after your feet! I decided after I had a long soak in the bath one evening ,I slipped on my just pedicured tootsies into the Pedi-Sox. I wanted my feet so stay moisturised for an overnight softening treatment while wearing the socks.this makes them perfect for wearing in bed. I also wanted to paint my toes while wearing the socks.I had no trouble at all doing this! One size fits all. Stretchy & solid construction. Machine washable they wash well and don't go out of shape and not to tight around the ankles.A heavier weight thick cotton blend. Triple weave body for cozy warmth and cushion. Flat weave for portion for foot comfort. A must for Wintertime pedicures. I am absolutely overwhelmed with the comfort and wearing ability of my Pedi-Sox. Great quality,very comfortable and warm socks.They do keep your feet warm and they breathe well. Wrap your Pedicured feet in soft-cushioned comfort you will love them as much as I do! I highly recommend the Pedi-Sox to anyone who loves to take care of there feet.for home use or for Salons They are fabulous. Check the Pedi-Sox Web site here. for the list of Distributors near you! 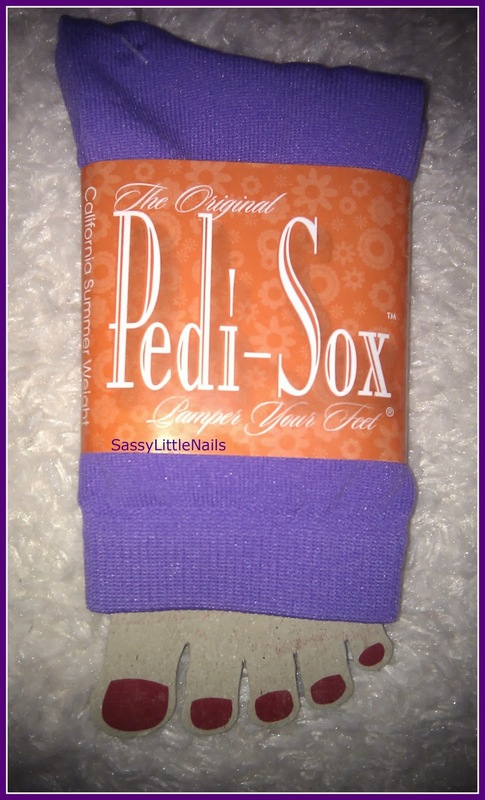 The only Distributor for the United Kingdom that sells the Pedi-Sox is..
Only Fingers + Toes Ltd. I want to Thank Pamela for sending me the Socks to review on my blog.Pamela was very polite helpful and supportive as well as very professional.such a lovely lady. Hi everyone I'm back with another quick post today! 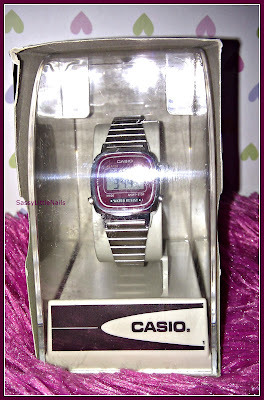 I was recently sent a Casio Mini Ladies Silver Tone Digital Watch for review. in 1974, a leading Tokyo-based electronics company brought its expertise to the craft of watch-making. Since then, Casio Watches has consistently manufactured high-quality wristwatches engineered to work as well in some of the most demanding environments on Earth as they do in the office. The range encompasses sturdy, waterproof and shockproof models for everyday use through to technologically advanced timepieces that place detailed environmental information such as barometric pressure, ambient temperature, compass direction and the current altitude on the user’s wrist. 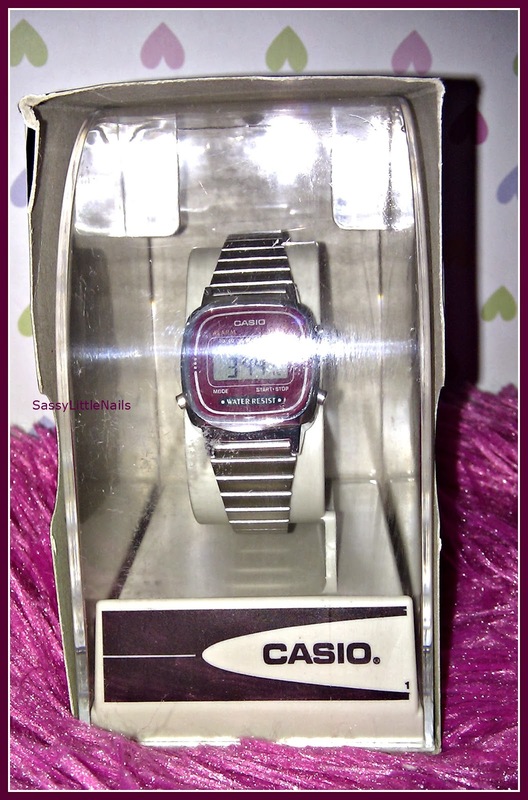 The Casio Watch reminds me of when I was 10/11 years old(80s child lol), I had a Casio Watch very similar to this one except my watch face was a light pink colour. 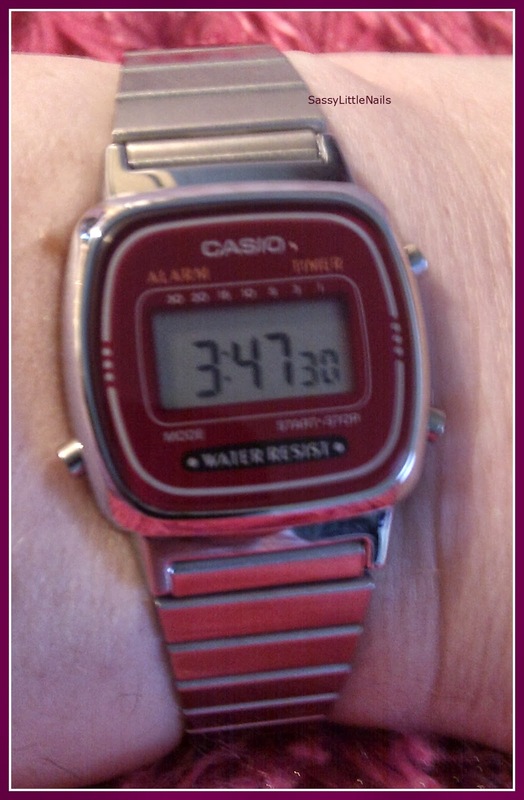 This Watch has a burgundy colour. 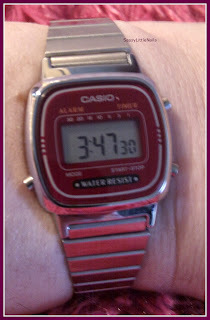 I remember my Watch lasting me a long time through school and play. It is a brand that gives good quality products and even though this Watch is not to my taste perhaps it would be more suited to a younger person or student. I have took a look at the The Watch Hut Web site and there is some fantastic Watches there at great prices! I love this Michael Kors Ladies Chronograph watch on there web site. picture took from the watch hut website. I am sure you are to find something to suit your taste or start your Christmas gift shopping for someone. *A press sample was sent to me for consideration for the purpose of this review only. No monetary compensation was received. Hiya Friends.Gosh this week has flown by! I hope you all good. 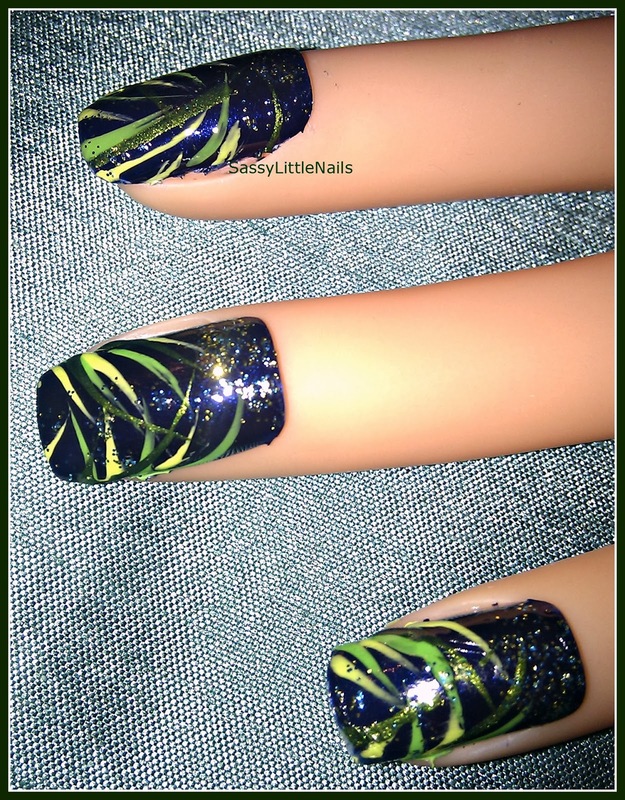 Here is a quick nail art post of Green grass blades requested by one of my readers. 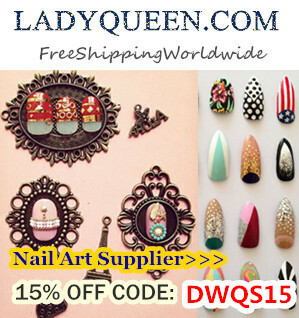 Disney nail art pen in green. 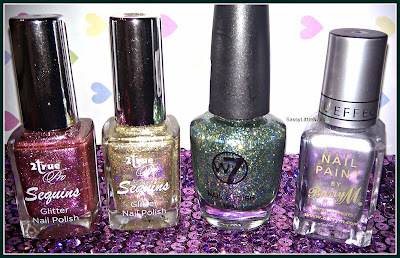 W7 nail glitter polish in Cosmic Green. 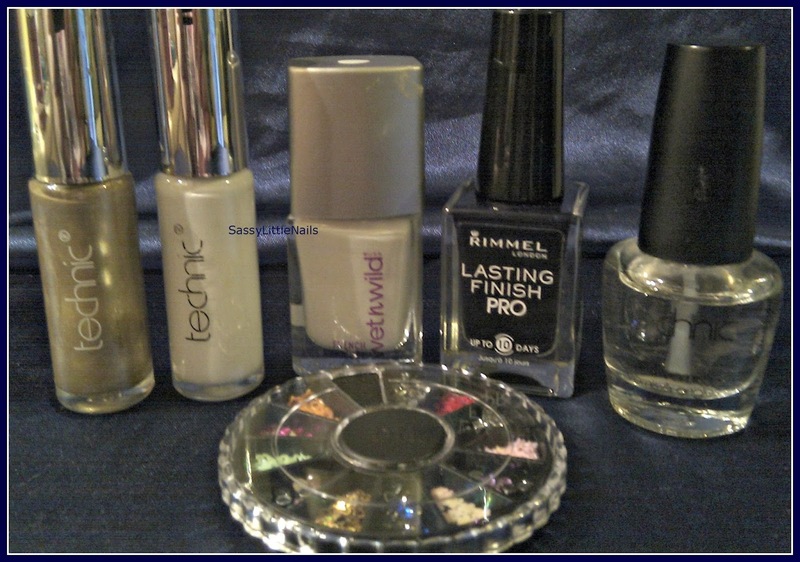 I started with painting all the nails with the Rimmel polish as a base colour. Then I started using the Disney nail art pen in the corners and gently flicking the pen upwards to make a grass blade.I then did the same with the Saffron polish and Technic polish using a nail art small brush. Once dry I then dabbed some of the W7 glitter polish on each nail then applied a top coat and all done! 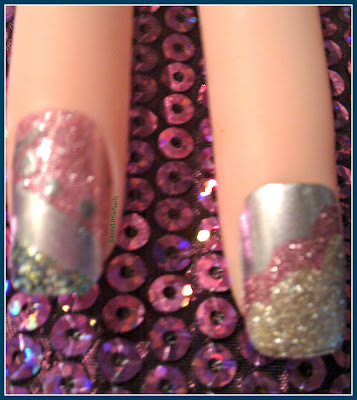 I hope you like this mani.its fairly easy to do. Hello Everyone. I hope you all keeping well this Autumn. 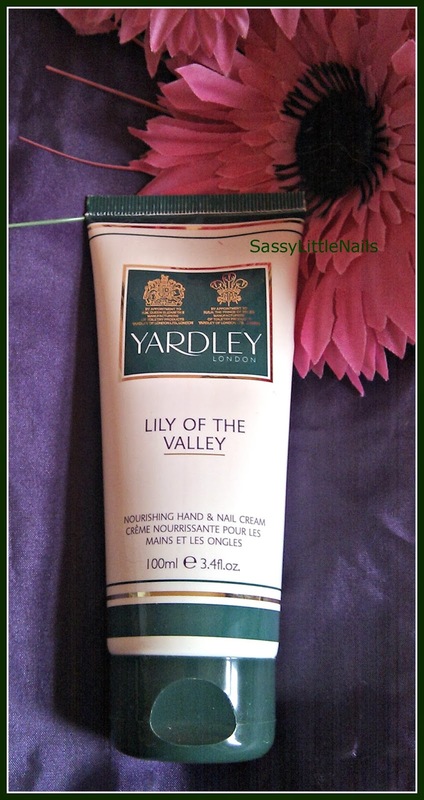 I have another product review for you today!I was kindly sent Lily of the Valley Nourishing Hand & Nail Cream by Yardley London. for review. Easily absorbed, containing Q10, shea butter, cocoa butter, grape seed oil and sweet almond oil, rich in anti-oxidant Vitamin E to help combat the signs of ageing. Leaves hands feeling soft and smooth, whilst conditioning and strengthening nails. Delicately fragranced with Lily of the Valley. I have been using this product for a few weeks now morning and night. I start by using a small amount and massaging it into my cuticles and nails.Then I take another small amount and gently rub it in my hands and fingers. The smell is delicately fragranced as Yardley states. I find it not over powering and a light floral scent which is nice. The texture is not to thick and none greasy it is a good luxurious formula smooth and soft. rubs in well. I have certainly noticed a good difference in the softness and look of my hands.I suffered with some dry parts on my knuckles cuticles and palms and since using this product it has helped. My hands feel more softer smoother and I really like this product for my hands. Yardley have a choice of scents in the hand cream although I haven't tried them I am sure they are just as nice. Now having said all this you may be thinking this brand is mainly for mature ladies?and with the Queens stamp of approval on it I say if its good enough for the Queen its good enough for me! :D Don't knock it until you try it.You wont be disappointed. Yardley London shown a professional and friendly manner with the communication and dealings I had with them. I want to thank Yardley for there kindness and support.